In the first part we have looked at the basic example of the Greek Gift Sacrifice presented in its simplest form. Today, we will take a deeper look into what are the conditions needed for this sacrifice to work, and when is it correct (or incorrect) to unleash it. 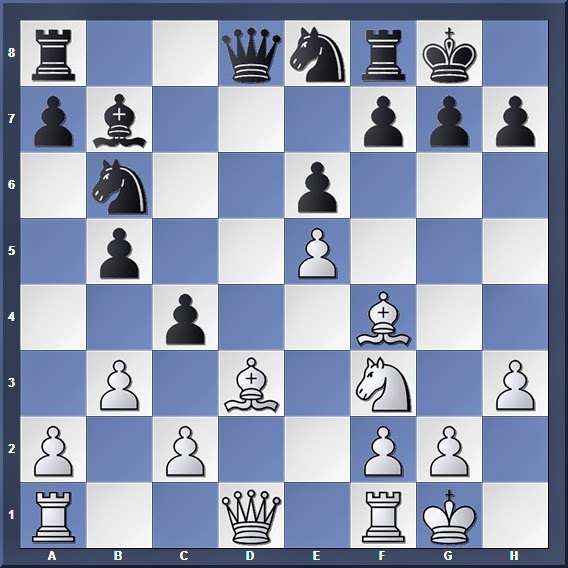 In his classic work "Art of Attack in Chess", Vukovic has taken great pains to explain the conditions needed for the classic bishop sacrifice to work, and thus I must give him due credit for what is to be presented in this article. For the gambit to be successful the attacker should have (apart from his bishop) a Queen and a Knight involved in the follow-up assault. 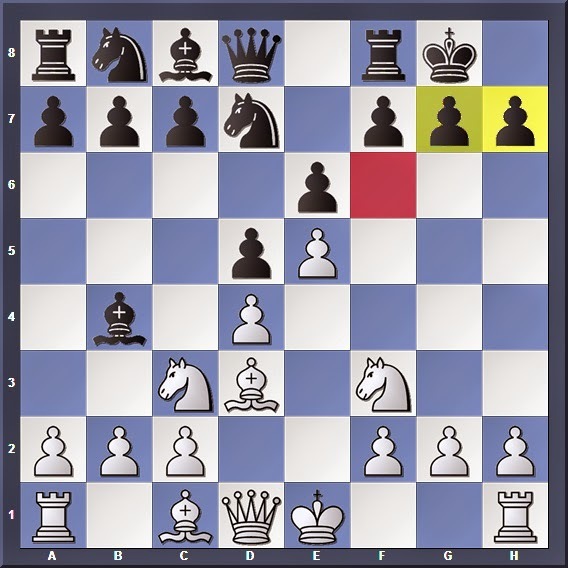 A quick glance at the above diagram should be clear enough: From its natural developing square, White's knight can quickly hop to g5 to hit the h7 square, where it is protected by the bishop on c1. 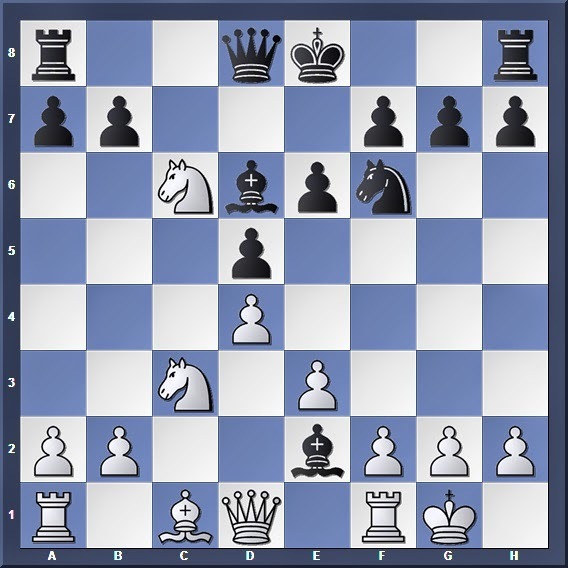 At the same time, it also clears the diagonal for White's Queen to access h5. This combination of Queen + Knight assault is the most common, and most direct method of hunting down the enemy king once the h7/h2 square has been cleared. I have highlighted several key squares that play an important role in the attack. The yellow ones should be quite intuitive; those pawns on g7 and h7 should have nothing blocking their way, though in rare occasions a bishop may be in place of the pawn on g7, or that there may be no pawn on h7 at all. But far more important is the f6 square (f3 in the case of a attack against White), which is a natural developing point for Black's knight where it helps to defend the h7 square. 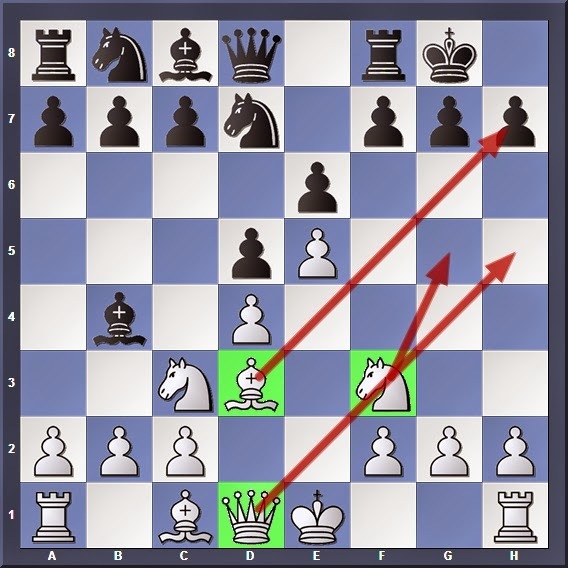 Notice how the knight needs to be chased away from this critical square (for obvious reasons) before the sacrifice on h7 can be successful. Another key factor for the success of the sacrifice is the fact that it would be detrimental for the opponent to decline the gambit. If the defender has the liberty of simply replying Kh8/Kh1 with no major side effects (or worse still, being able to turn the tables on the attacker) then it does not make much sense for the attacker to invest this endeavour. In the earlier example, we have already seen that should Black reply to 7. Bxh7 with 7... Kh8, then his position falls apart after 7... Kh8 8. Ng5 g6 9. Qg4 Qe7 10. Qh3 Kg7 11. Bxg6, thus justifying the effectiveness of the gambit in this position. The bishop has nowhere to go to, and after 2. Qe2 Bxf3 3. Qxf3 Kxh7 Black is up in the exchange. Notice that Black only takes the bishop after eliminating his opponent's knight, thus crippling White's ability to press on the attack. And there is no good reply to 4... Kg7 followed by 5... Rh8, trading two minor pieces for a rook with Black gaining the upper hand. Here Black can "sacrifice" his bishop with 1... Bxh2+, and if White accepts with 2. Kxh7 then Black wins the Queen after 2... Qd6+! (2... Ng4+ is also possible but after 3. Kh3 Black can't really follow up the attack). Thus White must decline with 2. 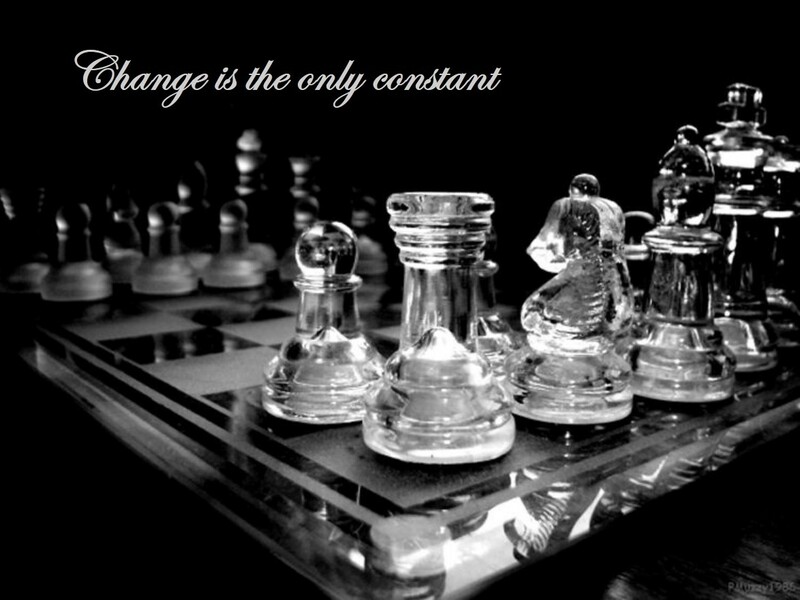 Kh1, and after the series of exchanges Black will be a pawn up with an advantage in the endgame. In this series I want concentrate mainly on the concept of the mating attack rather than that of winning material; as such, in our next article we will take a look at the subsequent variations that have to be taken after the sacrifice has been made.